A group of teens meet up to go on a road trip to one of the friend's parents cabin in the woods to drink, party and celebrate Presidents Day! 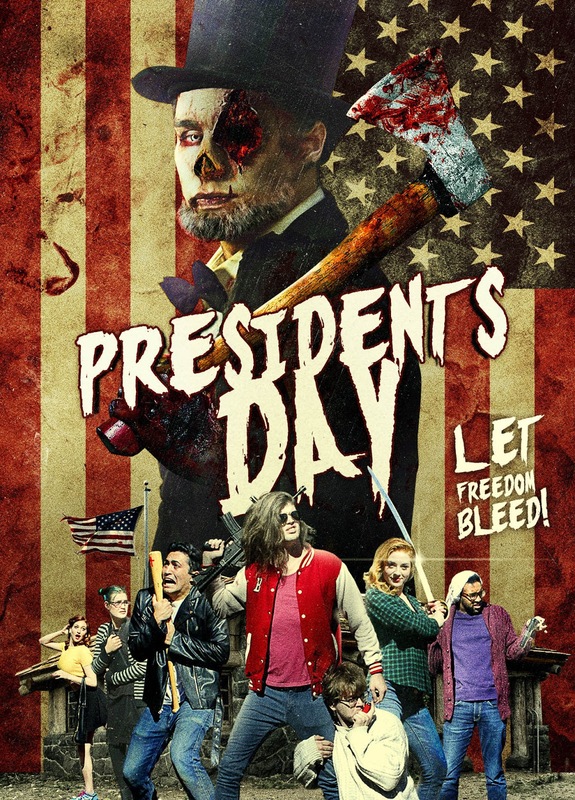 However, after they arrive a number of deceased American Presidents rise from the grave to murder the hapless teens, not too sure how or why.....just because. A book was written many years before to aide them as their panic grows to fight the undead presidents. With it they can summon the ultimate weapon, erm, John Wilkes Booth! This immensely entertaining horror/comedy takes a lot of its plot ideas from teen movies, slasher spoofs and zombie greats of the 80's and 90's and it is just tremendous fun! The 28 undead heads of state featured are very loosely based on zombies as they talk quite coherently considering and kill their victims with weapons without a hint of brain munching, they shamble along and are made up like your typical zombie would but that's about it in that respect. I would say they are more likened to a Deadite. The group of teens contains every stereotype you would expect the cool guy, the bimbo, jock, nerd, annoying yet attractive know-it-all, goth and token minority. These characters are all really well played by all the actors. Director David Zuckerman plays cool guy Jake with writer/ producers Benjamin Goodwin as Ruttigger the nerd and Jud Zumwalt as jock Brett. With other cast members doing a brilliant job with one liners, hilarious kills and wardrobe malfunctions a plenty. Brett, however, is my favorite character by far as the emotionally and intellectually challenged ape-like but lovable doof with the best dialogue and accent that will make you laugh out loud! The soundtrack is awesome featuring a catchy signature song. The special effects are OK the gore is kept to a minimum probably to keep the cost down but they do go down the practical route which is always a good thing. Its not original that much is obvious but it achieves its own quirky uniqueness and is a great watch.